Recently, I had opportunity to try Salt Block Cooked food in a party. I never thought cooking on a griddle of Himalayan Salt Block can be this much fun. For those, (like old me) who wonder if cooking on salt block will make food very salty? I am telling you - Not at all!! 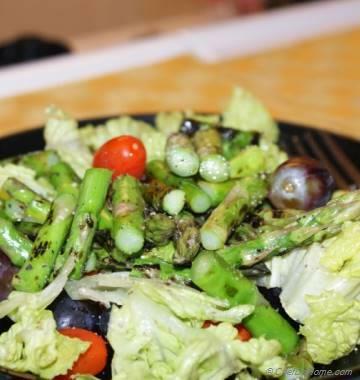 Food taste perfectly seasoned, though you don't need to pre-season your veggies. 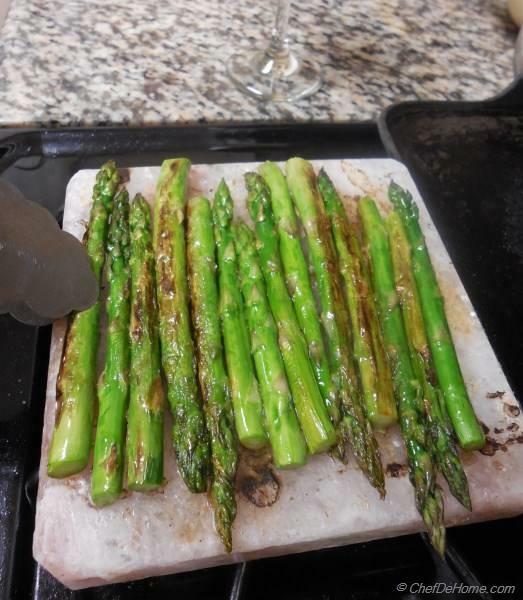 I grilled asparagus on salt block without seasoning and it was beautifully charred and nicely seasoned. Loved it!! 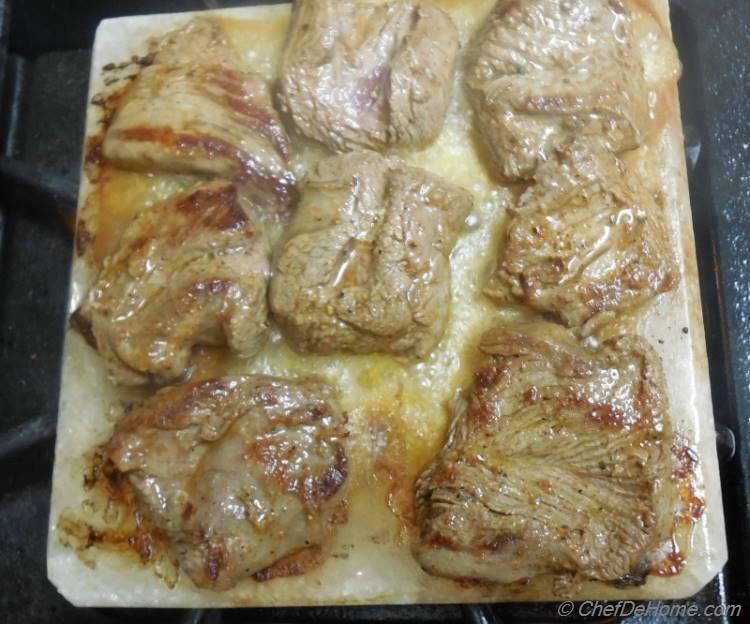 My husband always wanted to buy Salt Block and cook meat on it and I never agreed until I saw this beautifully griddle made-by-nature in action. Once I agreed that food tasted amazing and its a fun experience trying salt block cooked food at home, there was nothing stopping my husband. :) He bought a Salt Block and we cooked thin pounded lamb with homemade infused chili oil. Salt block seared the meat very well. 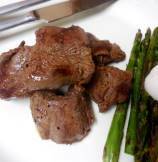 I marinated it in a simple lemon and oil marinade before cooking, but we realized meat cooked on Salt Block will taste great even without marinade. 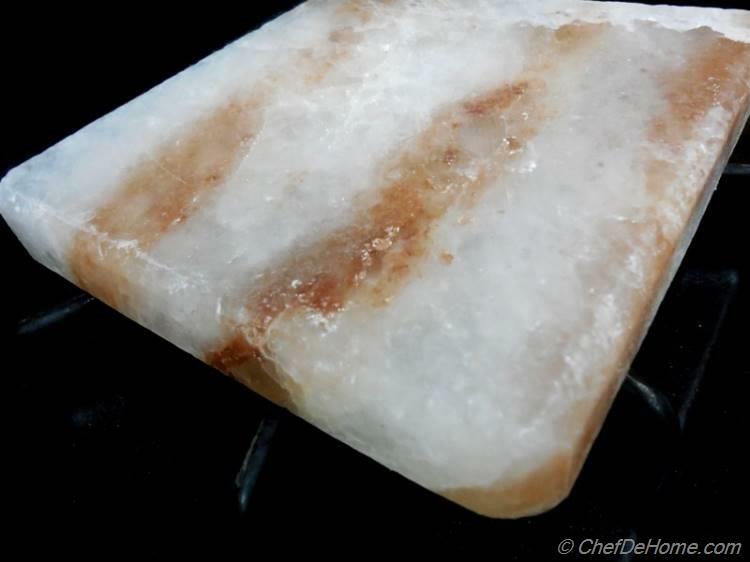 Salt Block Care - There are few things to remember when you cook on Salt Block. For first time use, Salt block should be heated at low temperature first, then gradually increase temperature to avoid cracks. 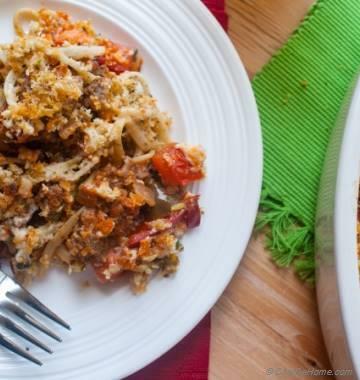 Likewise, once done cooking, let it cool on its on, then scrub it with a clean scrubber like you would clean a pan but don't use soap or chemicals. Let it air dry on its own, then wrap in paper and store at dark, dry place for next time use. And enjoy gourmet food at home! And yes, you can reuse it!! Salt act as natural sanitizer, once reheated, it will be fine for next use. Share with me you experience of Salt Block cooking. What would you like to cook on a Salt Block? 1. Slice the lamb pieces into 2-3 inch length and then pound them with a roller or meat pounder to make'em sightly thinner and wider. 2. In bowl, combine 1 tbsp plain olive oil, red pepper (if not using Chili Pepper Oil later), 1/4 tsp salt and lemon juice. 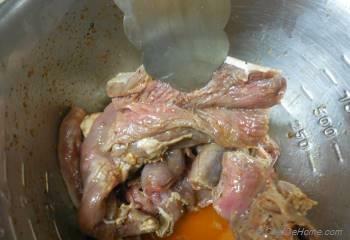 Add and toss lamb pieces and leave aside for 30 minutes. 3. Heat the salt block on stove on medium heat for 10 minutes and then increase the heat for 2 minutes. 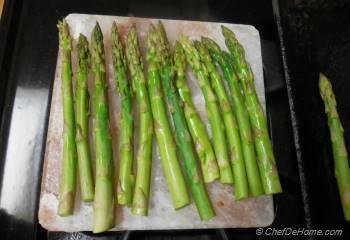 Place asparagus over heated salt block and sear turning once till nicely charred. 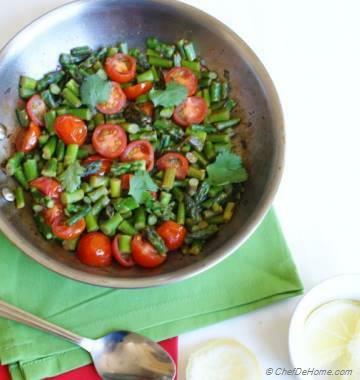 Add 1 tsp chili oil while searing asparagus. 5. 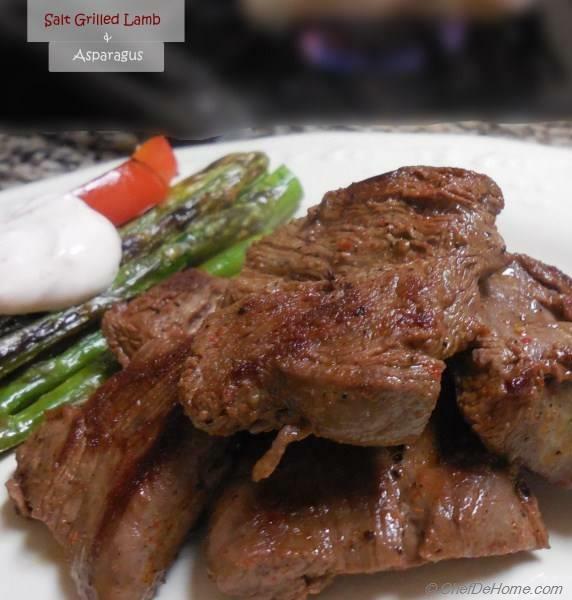 Serve lamb immediately with asparagus and sour cream on the side. Follow cleaning instructions to clean Salt block for storage and future cooking. DIY - You can buy Chili Oil from store or to make it at home - Fill a small glass bottle/container with fresh Thai Chili (4-5), then top it with extra virgin olive oil till chilis are fully immersed in oil. 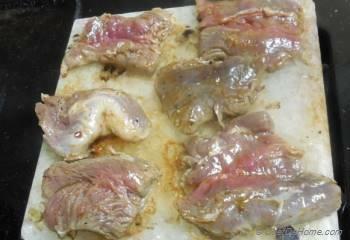 Seal tight and leave to infuse in a cool dark place for about 1 month. Fantastic! 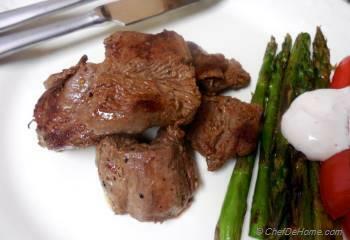 I tried this lamb and asparagus !! wonderful, thank you for sharing.